As I’ve written before, the culture is one of your company’s most important assets. It can’t be replicated easily and it’s your backbone that allows you to grow during good times and persevere during bad ones.It’s really hard to build a great company culture but here I’ll give you some tips on what we do on certain aspects. Hopefully, they’ll help you out if interested in this topic. Moreover, I’ll share something that we’ve just started to see. Something that makes us really happy. 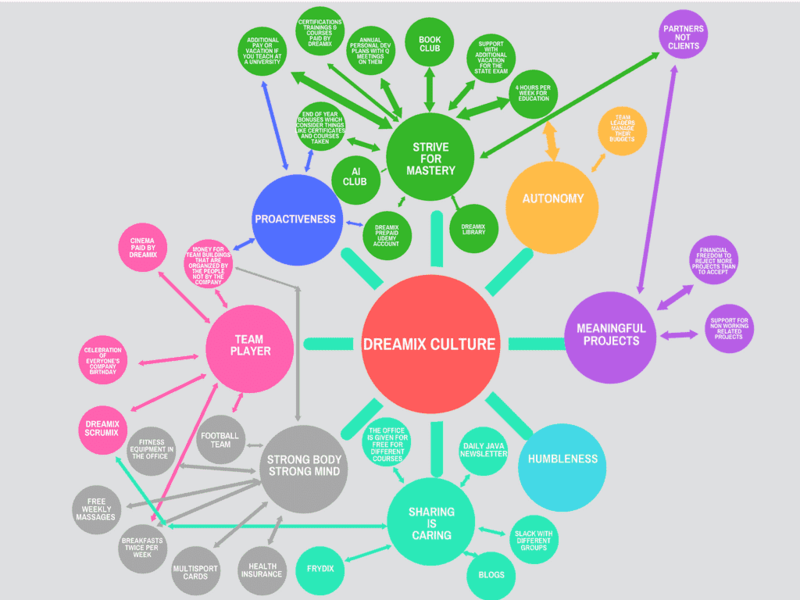 It’s a nice visualization on what we’ve decided to cherish in Dreamix. We have 8 main values that are the foundations of what we’re building. From there you can see concrete activities, initiatives and more that support these values. The values are not just nice words but the stars around which we’ve built our company. – What sources does the candidate follow to stay up to date? – How does he/she learn new things? What are their techniques? – Does he/she take any courses after work? – Sharing a moment where a task was given to him/her without any directions. How did he/she find the solution? – Is he/she asking questions during the interview? Is he/she prepared? – Sharing a time when he/she had to better something at work? Why did they do it? – Has he/she been a volunteer somewhere? – How is he/she making a decision? Do they ask their teammates? – What has he/she learnt by their colleagues? – Has he/she written articles? Have they made any presentations? – Has he/she been a buddy for the onboarding process on a new colleague? – Has he/she been a mentor to someone? – Partners not clients – with partners you can participate in the decision making, they want your feedback and thus you can influence the decisions on technologies and processes used. Culture is not stale. All these initiatives are changing. Some are removed and new are added constantly. Dreamix has a process on giving feedback every six months and from there one can easily see which activities are cherished and which are not. Change is a constant so embrace it. Currently, we’ve started to see that our partners really enjoy our culture and on top of our software development services they started to ask us for help on improving their company cultures. This is a great recognition for our efforts that we didn’t expect. In conclusion, I want to say, that more and more companies must pay attention to their culture because people are what makes a company – especially companies in the service industry like Dreamix. If you have a company culture that enables employees to constantly grow and improve, they will become better professionals and thus you’ll provide better services. If your people also develop on a personal level, they will add to your culture, and thus it’ll constantly better. And if your employees market value increases, your company’s market value increase. Your people are your company. So invest in a company culture that supports, empowers and engages them!